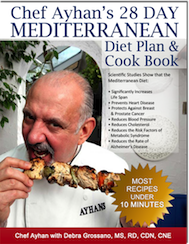 Debra compared Ayhan’s Mediterranean Menu Plans® vs. South Beach Diet™. Based on restaurant quality recipes. Based on restaurant quality recipes. Promotes healthy, monounsaturated fats. Promotes healthy, monounsaturated fats. Low in unhealthy, saturated fats that come from meats and cheeses. Low in unhealthy, saturated fats that come from meats and cheeses. Online membership includes access to a nutritionist. Online membership includes access to a nutritionist. Promotes moderate intake of alcohol, especially wine. Does not allow wine or alcohol in first phase of diet. Provides a well balanced diet, with no restrictions. Does not allow certain fruits and vegetables, such as, carrots, white potatoes, pineapple, banana, and watermelon, which each have their own nutritional benefits. High in fiber. High in fiber, only after the initial, very low carbohydrate phase. You can order your foods for the diet directly online and have them shipped to your home. No online food purchases can be made from the website. All meals and snacks are portion controlled to ensure long term weight loss. Does not promote portion control. A diet that has been around for thousands of years and has been shown to increase longevity and decrease the risk of major diseases. A new “fad” diet with no long term studies done. South Beach Diet™ is a registered trademark. All product and service marks are the trademarks of their respective owners.